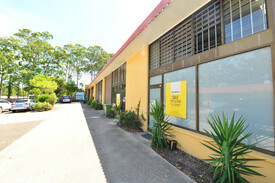 31 Commercial Real Estate & Properties in Noosaville are listed in 5 categories. We have 22 Industrial Warehouses Sale , 3 Development LandsSale , 3 Retail ShopsSale , 2 Hotels and LeisureSale and 1 OfficesSale . Only Four Left - Storage Sheds From $202,000 From $202,000 + GST (if a.. This uniquely designed development is perfect for trades storage and workshops for builders, plumbers, electricians etc. The ultimate man cave suitable for car restoration workshop, caravan or boat storage and small business uses. Dual rental capability or rent out the carport whilst using the workshop. 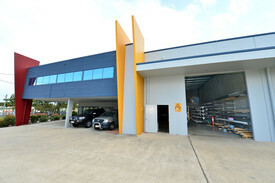 + Total lot sizes from 105.7sq m (approx) including exclusive use outdoor areas + High clearance warehouse + Multiple roller doors + Fully fenced with security gate + 24 hour security camera + Seven of the units have already sold Call or email Tracey Ryan or David Brinkley to inspect the property or find out about other suitable options. Our team is strategically located in two offices across the Sunshine Coast region and is ready to handle your commercial, industrial and retail property needs today so call or email now. Noosa Riverfront Freehold Opportunity Offers over $1,200,000 + ..
Why lease premises when you could owner occupy. This ground floor tenancy is on the market for sale. Whether you are hunting for a retail shop / restaurant / bar or perhaps a professional office with views straight across the Noosa river, this is hard to beat with its slightly elevated position providing an exceptional outlook for both staff and customers alike. + 101sq m (approx) tenancy directly opposite Noosa River + To be sold with vacant possession + Suit retail shop / restaurant / take away / bar + Centrally positioned in the main retail / restaurant strip on Gympie Terrace + Allocated car park and storage + Strong street exposure + Neighbouring tenants include Bavarian Hof and Depot Cafe + Other popular restaurants / cafes nearby: Gusto Riverfront, Little Humid, Rasa Modern Asian, Grind Cafe, Krung Thep Thai, Sirocco and Thomas Corner Call or email David Brinkley or Paul Butler to inspect the property or find out about other suitable options. Our team is strategically located in two offices across the Sunshine Coast region and is ready to handle your commercial, industrial and retail property needs today so call or email now. Don't miss this opportunity to promote your business in a premium 12 unit development with excellent main road exposure and a bright, airy aspect. High clearance electronic roller door opens up to well insulated warehouse space configured to be easily separated into office and showroom and warehouse space. The amenity blocks are out of the way at the rear of the building providing maximum clear space accessibility. + Well appointed 174sq m (approx) warehouse + Promote your business to the approximately 10,000 vehicles (approx) and pedestrians passing per day + Light filled warehouse with direct roller door access + Allocated car parking space + Available immediately for sale or lease Call or email Tracey Ryan to inspect the property or find out about other suitable options. Our team is strategically located in two offices across the Sunshine Coast region and is ready to handle your commercial, industrial and retail property needs today so call or email now. Selling Fast Only Four Remaining From $344,500 + GST (if a..
Noosa Landscape Supplies have been supplying materials to local builders and residential home owners for over 20 years. Positioned on one of the last remaining industrial sites in Noosaville this property presents a number of opportunities. The site can be purchased and and the business will trade down. The business and site can be purchased as a package. A family run business trading six days a week could be up scaled to seven days a week to target more weekend trade. + Established landscaping and earth moving business for sale + Trading for over 20 years. 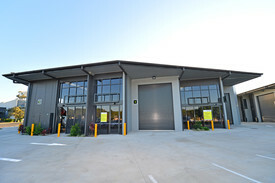 Walk in, walk out + 273sq m shed on 4,999sq m industrial site for sale (sizes approx) + Opportunity to re develop site + Well located within Noosa's industrial hub and in close proximity to major residential areas Call or email Tracey Ryan or John Petralia to inspect the property or find out about other suitable options. Our team is strategically located in two offices across the Sunshine Coast region and is ready to handle your commercial, industrial and retail property needs today so call or email now.